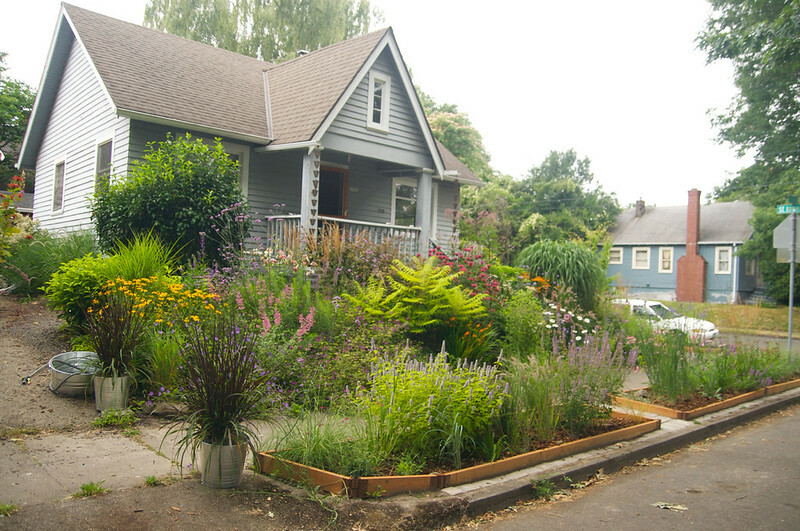 Rhone Street Gardens: Whaddya Think? Hello everyone! I know, I know...I've been slacking lately. This past weekend Portland seemed to jump from spring directly into summer for a few days. I have to admit, it was a bit TOO warm for me. In addition to the unseasonable warmth, we've only gotten about half of the usual rainfall that we should get from January-March (6" instead of 12"). Regardless, the biggest project I'm tackling this year is, well, lots of small projects! As with every garden, there are a few spots in my garden that always seem to give me trouble. One of the areas that I feel defies my efforts to tame is this corner in our front garden. Sadly, the front slope of our garden here is the worst soil I've ever encountered. It's ridiculously heavy clay...and seems to smother the life out of many plants. The Agastache 'Desert Sunrise' have never thrived here (I'm lucky they still live...this spot has killed quite a few other plants). They just never look happy, and right about the time they bloom, the stems start to splay badly. I've been thinking for the past few years that this spot just needs a strong structural plant...especially since all the surround plants are fairly airy. I also want something with dark foliage. The best solution I've come up with, so far, is to plant something that really proved itself last year, Pennisetum 'Vertigo'. The pair I had in pots here were beautiful, but, unfortunately, not hardy (unless they are just REALLY late to re-sprout). So...I would get the color and form I want...but would probably have to purchase it every year. I've also been considering Canna 'Intrigue'. While I'm not the biggest fan of Cannas in general, I saw this one at, of all places, a mall, last year and really fell for it. I like that its leaves are a bit narrower and more refined...and that weird pewter-y purple color is fabulous. I don't like the flowers, but can always pop those off, right? My concerns about this plant is that it might be just a bit too tall...and overwhelm the space...also, there isn't alot of horizontal room...although I could divide it every few years, I suppose. Also, I've read that Cannas like quite a bit of water...and although on a drip system, I have trouble keeping water-hungry plants alive during the heat of summer...just ask my dearly departed Rheum palmatum, Monarda 'Aquarius'...well, you get the picture. One of my chief demands of most of the plants I chose these days, is that they have some degree of winter interest. In this department, 'Vertigo' would seem to win out. I was surprised this winter and just how nice they looked (unusual for tropical grasses, which usually collapse at the first frost). Cannas, unfortunately, do tend to melt with the onset of colder temps. So, what do you think, would you chose one of these...or do you have another, even BETTER suggestion??? I think I'd go with the Vertigo, but expect it to possibly get much larger than it did in the pot -- that's been my experience with other grasses. I also forgot to ask: I'd love to see the same wide shot of your garden as it looks right now. I'm definitely leaning towards 'Vertigo', Alan...it seems more fitting for my garden. I considered Colocasia for a bit, but I'm not a huge fan of things that are too tropical...and I know it would fry to a crisp, sadly :-( I should have posted a current photo...although it looks pretty sad and bare at the moment! What about a dark-leaved smoke bush? You could cut it back to the base each spring so it doesn't get too big. Glad to hear about another canna non-fan. They're so popular but have never tripped my trigger, though you're right that the narrow dark leaves on the one you photographed are nicer than most. I wish I had room for Smoke Bush...I love them! Or 'Black Lace' elderberry - but that gets 6-8' tall/wide or more in Portland. I was going to suggest the same thing as Loree. I really like that Canna, though. I'll have to find one for me. I really like that canna. Really really. I know, right! Even if I don't put one in this spot...I think I'm going to get one anyway...I can always put it in a container, right??? If you put the canna in a container, you could switch it out for something with winter interest once it gives up the ghost. Rhododendron 'Ebony Pearl', for instance. 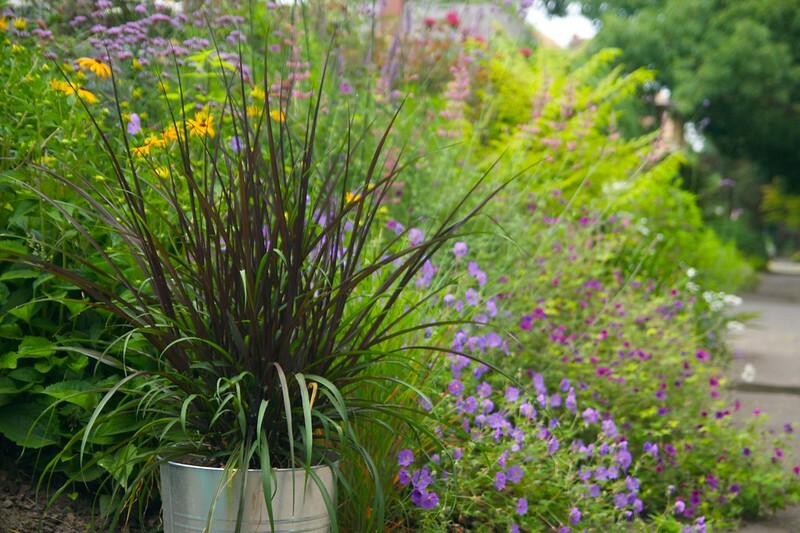 I love seeing big containers nestled into borders, and they give us so much wiggle room. Ricki...you are a genius...I LOVE that idea!!! I like 'Vertgo' ad 'Intrigue' i my favorite canna! When the light hits those leaves, there's nothing quite so gorgeous. Ricki's tought is inspired. Big gorgeous pot with either. You could throw some evergreen boughs in it for the winter and/or red dogwood twigs for winter and maybe a few spring bulbs. It's so pretty, isn't it...like stained glass! I agree, Ricki's idea is so good...I doubt I'd ever have thought of it! There are a number of burgundy-foliaged Nandinas, like Burgundy Wine and 'Nana Purpurea', that is dwarf as well, the mature foliage may be more green but the new leaves are burgundy, and it would be very tough. I like Nandinas a lot, the regular ones look like they are on fire in fall, and the foliage is feathery. I have Canna'intrigue' I love it, but I'm a Canna fan. 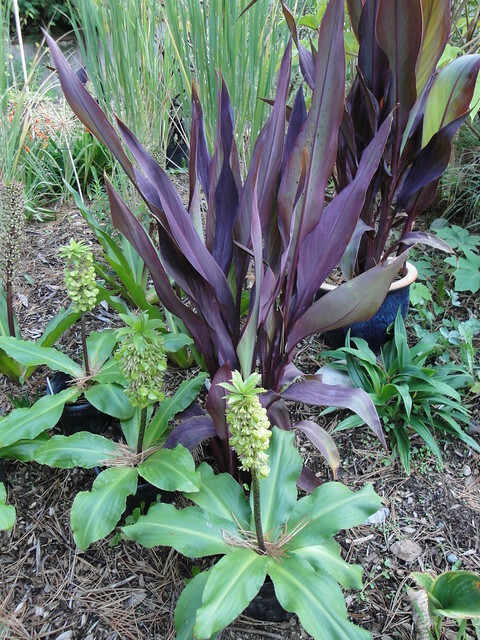 I 'm also an unashamed Phormium fan, I did have P. 'Dark delight' which doesn't get too huge. The vertigo looks amazing, I definitely vote for it - besides I've never liked cannas either. And isn't it possible that it could survive the winter in the ground? Plants in pots always die off at a higher tempature than ones in the ground, right? Good call, I also prefer the grass and think that Scott should give it a shot in the ground if there is a chance it will make it. That's exactly what I was thinking, Fairfax...the Pennisetums may very well over-winter if they are in the ground (especially if mulched with leaves)! D_Y...absolutely, I'm going to give it a try in the ground and see what happens...it's worth a try, right? I guess I would go with 'Vertigo'. 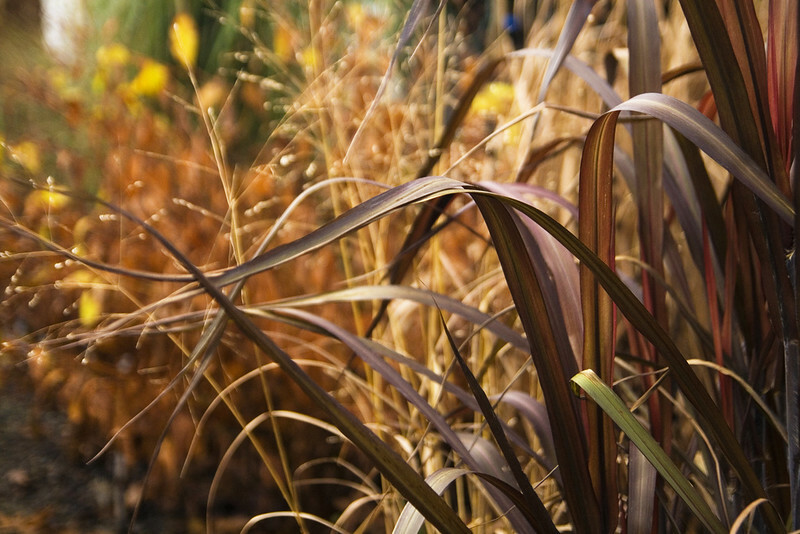 Although my nativist tendencies make me think of Panicum 'Shenandoah', though I realize you already have lots of switchgrass. You know what, Jason, 'Shenandoah' was my first choice for that spot! I also prefer them to exotics, as a rule, but I was afraid that what the space really needed was a bit "bolder" texture to break up all the fine textures. I still haven't totally decided, but as I walked around this weekend again, the idea of more Panicums (you can never have too many) was VERY appealing! Seriously, in my garden, my Bronze Fennel outright laughs in the face of clay. I've actually started planting it in my worst areas, and it's been coming back bigger and badder every year for at least five or six years. Only caveat: deadhead after it blooms, otherwise you'll have about 6,000 more to play with. Beautiful. Finally, some rain today. Our new plants were thirsty. YES! So glad for your rain...I was so relieved last week when we finally got some rain too...it had been too long! Bronze Fennel would work but you must deadhead it or you'll have a bazillion babies. What about Persicaria 'Red Dragon'? You'd have bulk, dark foliage, contrast and you can clip it back to keep it bushy. Of course no winter interest... Weigela 'Wine and Roses.' If you planted a Smoke Bush you could keep it small by cutting it down to the ground every winter. Ditto for Sambucus 'Black Lace' Nine Bark or Catalpa--to color-echo 'Tiger Eyes.' Pink flowered Gaura would give you the pink flowers and dark foliage. There are dark foliaged Sedums (like 'Autumn Joy'only burgundy). 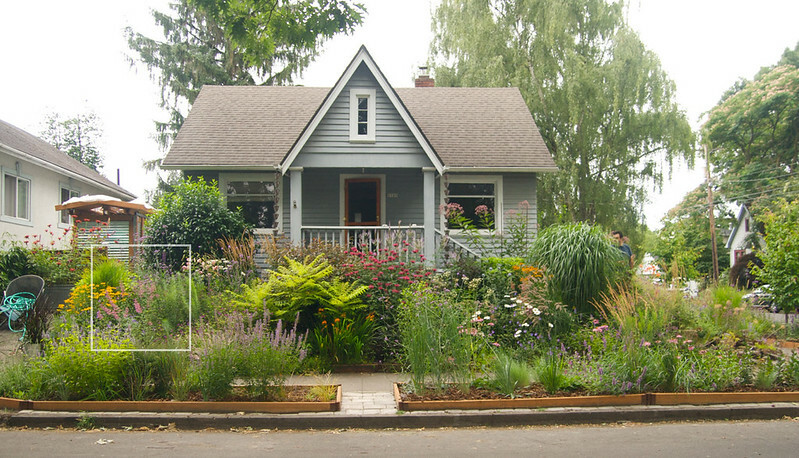 You could plant a big fat dark-foliaged Dahlia there too. Or a Castor plant... Oh, I'm having fun with this Scott. I must say your garden is absolutely gorgeous and anything you choose is going to look wonderful there. Please keep us posted. Hahaha...those are all great ideas, Grace! I would dearly love to have a Sambucus or Ninebark there...but I'm AWFUL at pruning (read, a big weeny) that I'm afraid they'll get too big for the space. I actually had dark Sedums there a few years ago, and they totally died (which is CRAZY, right)!!! 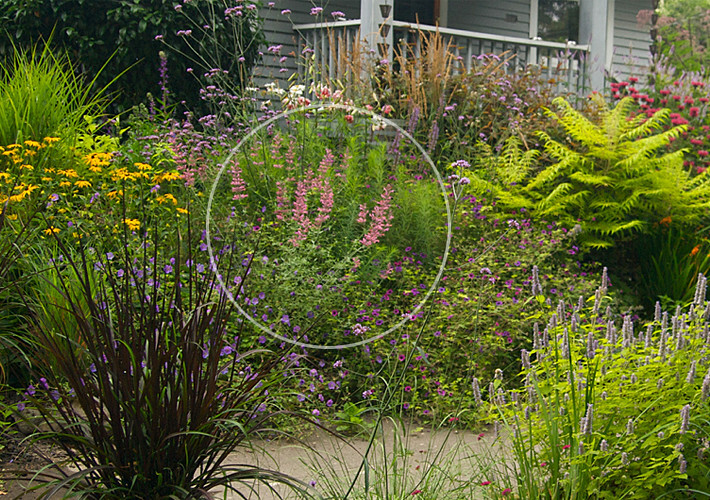 I LOVE the idea of the Gaura, and actually looked at them this weekend at the nursery...almost bought one....but do you think it will be too much "fine" texture along with everything else??? LOVE that 'Vertigo'. I get weak in the knees looking at your photo of it. Must. Have. In fact, how did I miss it when visiting your garden? I agree that the canna, lovely as it is, is not the thing and will crumple into a brown mess at the first hint of frost, if not sooner. Several people have already mentioned a dark Sambucus. How about a dark Physocarpus, say 'Summer Wine'? With ruthless pruning it could be perfect, and it's quite drought tolerant. 'Vertigo' is to die for, Jane...I think you'd love it! You and Grace both Mentioned the Ninebark...perhaps I'll look into it more...I may have to call you for pruning advice, I'm horrible with shrubs! You ever think about adding gypsum? I had a really intractable clay spot in my garden, and six months after adding gypsum and putting loads of redwood mulch on it, the spot was light and airy and fluffy and a delight to work with. The scary thing is, as much as I want to make the soil better, since our house sits on it, I'm afraid of making it too light...and not being able to suppor our house...is that just me being paranoid (it wouldn't be the first time)! I'm not sure exactly how it would do, I think it might be floppy and the foliage might end up more green than purple, and it's a reseeder but I could see you having the purplish Trachelium that Annie's Annuals sells. It's pretty nice, not sure if it has winter interest. I could see one finding a home somewhere in your garden. Also, I like the suggestions of a lace leaf black Sambucus or a black Physocarpus. They both look pretty sweet if you control the size and shape a bit. They both like clay pretty well. But I also think you're doing pretty well already, so you're instincts are probably right about the Pennisetum. In my experience the pennisetums do leaf out really late. That's definitely a problem with those Pennisetums, isn't it...you have a fairly large area of bare dirt that you have to look at for several months before they really get up to size! I'll have to look up the Trachelium...sounds gorgeous! Scott, just a note to say hi and thanks. - I found you yesterday - yesterday!! Your garden is gorgeous gorgeous. I've popped you up on the toolbar next to Margaret and Nan. Oh my - seriously? I don't even see what you mean. Everything looks perfect to me!!!!!!!!!!!! Awww, you're too nice, Heather ;-) I have to say, there's nothing "wrong" with it the way it is....but you know how it is, we are never happy, right! I can't decide which I like the best, but I am not a canna fan. physocarpus opulifolius 'Monlo'which you can coppice it for size control! That would look gorgeous! A Springtime Visit to Joy Creek!